The Native Woodland Trust (NWT) is committed to saving the last of Ireland’s remaining ancient woodlands, through education, raising awareness and direct intervention. NWT is also committed to the restoration and expansion of these relict forests, through their re-creation, using only tree seed collected locally. The NWT already owns and manages seven woodland nature reserves across Ireland – including remnant ancient woodlands, as well as sites where new native woods are being planted. The NWT runs volunteering activities on all of these reserves, including nature walks, foraging demonstrations and various educational events. All of the trees are planted by volunteers and members of the public and anyone is welcome to attend these events. All NWT reserves are open to the public. 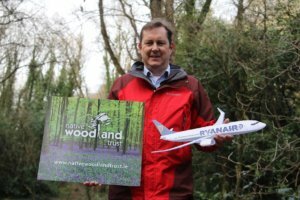 The Native Woodland Trust is one of Ryanair’s 2019 environment partners. 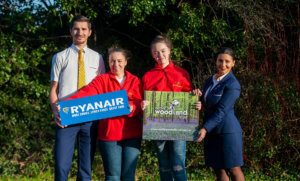 A portion of all Ryanair customers’ environmental donations will go towards the purchase of land near one of the last ancient woods in Ireland. NWT will collect tree seed only from within this wood, establish a tree nursery on site and plant a new forest which connects to the original wood – thus extending the existing forest, using only trees which originated in that specific forest. By not bringing trees from further afield, it avoids risk of introducing outside genes or diseases. Extending the boundaries of the wood will also increase its critical mass and buffer it from outside influences. Ancient woodlands are the last remnants of the massive forests that once covered all of Ireland. They are home to a unique assemblage of biodiversity and there is no better woodland in Ireland that we could seek to extend nor from which to collect native tree seed. Afforestation is one of the ways of removing carbon from the atmosphere. By owning the land, NWT ensures the protection of woodlands in perpetuity. For this particular project, by acquiring woodland in proximity to existing ancient woodland – home of many rare species which will colonise the new woodland – ecological benefits are higher than starting a new woodland on a bare site. Moreover, the tree nursery could be retained to produce trees from this source, for other plantings in the area to the benefit of local communities. This is a unique project in which we will be expanding existing ancient woodland and contributing to the offset of carbon in the atmosphere. “The Native Woodland Trust relies heavily on corporate sponsorship and public donations for the vast bulk of our income – over 95% in some years. In return, we protect seven woodland reserves across Ireland, with more becoming available in the near future. These reserves provide amenities to local communities, as well as protecting rare and endangered wildlife. Our publicly accessible events bring people together and provide a social outlet to many otherwise isolated individuals – with fresh air and healthy activities included!